The second of three free, live outdoor screening direct from the Royal Opera House to Trafalgar Square over the summer, Kasper Holten's production of Don Giovanni is played out by an excellent cast including Christopher Maltman as Mozart's timeless anti-hero. The "handsome" (Telegraph) set by Es Devlin puts a staircase split house centre stage, providing an eye catching backdrop against which Dorothea Roschmann, Rolando Villazon and Albina Shagimuratova sing. 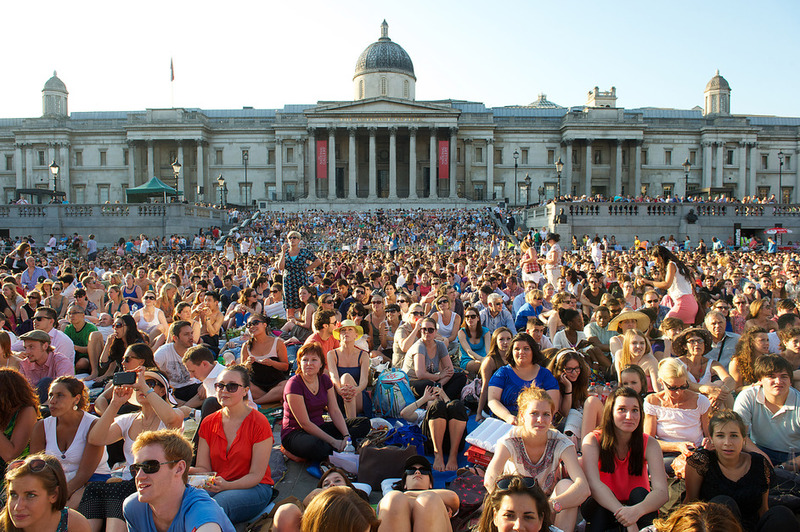 What are the best dining options near BP Big Screen: The Royal Opera: Don Giovanni London? BP Big Screen: The Royal Opera: Don Giovanni gyms, sporting activities, health & beauty and fitness. The best pubs near London BP Big Screen: The Royal Opera: Don Giovanni. BP Big Screen: The Royal Opera: Don Giovanni clubs, bars, cabaret nights, casinos and interesting nightlife. Where to have your meeting, conference, exhibition, private dining or training course near BP Big Screen: The Royal Opera: Don Giovanni. From cheap budget places to stay to luxury 5 star hotels see our deals for Trafalgar Square hotels, including The Trafalgar St. James London, Curio Collection by Hilton from 81% off.